In analyzing Mayor de Blasio's stewardship of city schools, there are several themes that emerge. First, there is a distinct lack of urgency in delivering results for students. Second, his policies are not based on research. He has ignored evidence that programs like small schools and expanded choice work. Third, he has not shown results on failing schools. And finally, the mayor has ignored teacher quality. Throughout the course of his time in office, this mayor has not shown much fondness for the details of his job. He seems more comfortable pondering the course of progressive philosophy or knocking on doors in Iowa, for example, than he does in setting specific timelines and metrics for results. Take his much-hyped program to have every child read by third grade. The goal is noble, but he doesn't promise results that can be measured until 2026 – long after he is gone from office. What good does that do for kids who will be trying to learn to read this year, or next year, or for years after that? A strong education leader understands that setting realistic short-term targets is essential to tracking results and ensuring progress towards a greater goal. Without real, deliverable metrics, these programs are little more than press releases with empty promises that may never come to fruition. Another hallmark of Mayor de Blasio's time in office has been a fundamental rejection of data and research-based decision-making. Under Mayor Bloomberg, the school system was improving – but Mayor de Blasio has rejected the use of evidence as a personal rebuke of his predecessor. In its place is a menu of nice sounding initiatives that have never been shown to actually improve educational outcomes for kids. Time and time again, Mayor de Blasio has opted to make education decisions based on politics, even when it means rejecting policies that have a proven track record of success. Take small schools as an example. Countless studies have shown that small schools work, but the de Blasio administration has rejected them for political reasons. The same is true with charter schools. Even though New York City has the longest waiting list in the country, with tens of thousands of parents hoping to get spots for their kids in charter schools, the mayor has fought tooth-and-nail against them. Why? It's not about serving kids; the mayor's political allies in the teachers union want to stifle their competition. These politically-motivated decisions threaten to trap another generation of students in failing schools, with no hope of a turnaround. The "Renewal" model was supposed to be Mayor de Blasio's signature program, but so far it has accomplished little for kids in the city's lowest performing schools. Some Renewal schools hit their target goals before the program had even started – a sure sign of artificially low expectations. And despite the claims of progress, objective student achievement measures show that these schools continue to perform poorly. 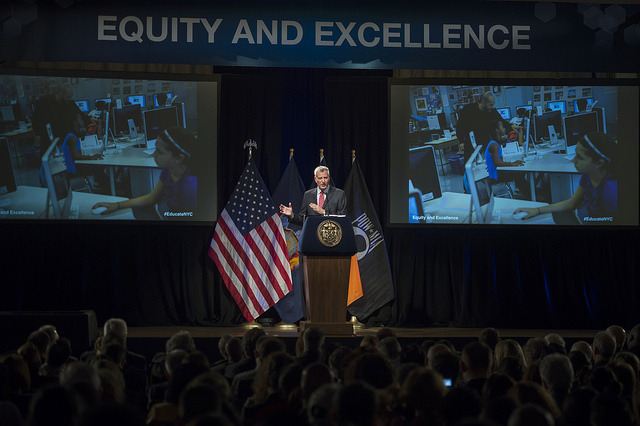 Finally, Mayor de Blasio has not lifted a finger to improve teacher quality. He missed a golden opportunity to improve teacher quality with fundamental reforms during the 2014 teacher contract negotiations. Instead of reform, de Blasio caved to the UFT on every key issue – everything from merit pay for great teachers to eliminating the unwanted teachers from the ATR pool. The mayor likes to call this "collaboration," but in reality, the UFT gets what it wants at the expense of kids. So students are stuck with ineffective teachers and the teachers that no principal wants are forced back into the classroom. At the end of the day, we need to know that students are learning and have access to the highest quality schools possible. Halfway through Mayor de Blasio's term, it's not enough to talk a good game. It's time to deliver results. Jenny Sedlis is the Executive Director of StudentsFirstNY. On Twitter @JennySedlis & @StudentsFirstNY.